There could be several reasons for repairing the MDF doors on your kitchen cabinets. Before you do though, it would be a good idea to check out this article on Thermofoil Cabinet Door Warranties. It’s possible that you can have them replaced rather than going through the aggravation of attempting a “do it yourself” repair. There are two common occurrences related to MDF doors getting damaged. In this article we will look at a proven technique for fixing loose kitchen cabinet door edges. -Remove the cabinet door by either unscrewing the fasteners that are holding the door onto the hinges or if you have a European cup hinge, it’s possible that there’s a releasing clip on the back of the hinge that needs to be lifted up on. -Place the door to be worked on face down on a towel or drop cloth. 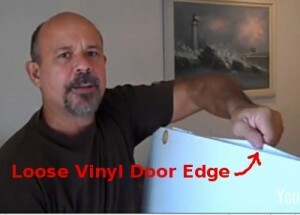 -With your finger, gently pull back the loose MDF door edge. -Squirt some of the Elmer’s Glue All in the gap between the kitchen cabinet door board and the vinyl that is coming loose. -Press the plastic with your fingers tight to the door’s board. -Wipe off the excess glue with the damp sponge or rag. If you find that it is going to be necessary to replace your Thermofoil cabinet doors, study this article installing kitchen cabinet doors. We have been repairing MDF kitchen cabinet doors this way for a long time. The method works great. In order to glue any loose drawer front vinyl, you just need to remove the contents of the drawer and then take it out of the cupboard. Then, follow the same procedure that you used on the MDF cupboard doors for repairing the loose edges. This entry was posted in Thermofoil. Bookmark the permalink.